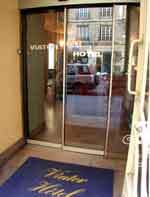 Two stars Hotel Viator , near Gare de Lyon and few minutes from la Bastille and the historical Marais area. Simple, comfortable, sound-proofed, cheap : this is what you need when staying in Paris. You can count on us for a warm and personalised welcome. As we are a 2 star hotel, we can get in touch with every guest and answer his needs. 45 rooms are at your disposal, in a simple and agreeable decoration. One step from Gare de Lyon, a few minutes walking to La Bastille and Bercy.